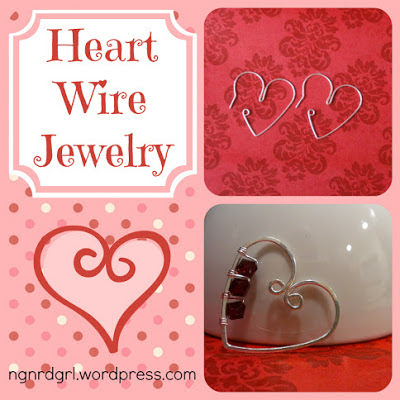 Did you catch my Heart Jewelry Inspiration from last week? Well, here is what I have been up to this past week! My coworker has a pair of heart hoops that I just love on her. After seeing a whole bunch of heart wire jewelry on Pinterest, I decided I wanted to give these a try. I used this tutorial by Jenni at I Spy DIY as my jumping off point. Wire 1: tools, wire and the basic loop - covers a basic understanding of wire working and basic tools. 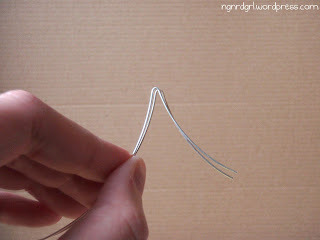 Easy Peasy Earwires - more techniques and tools used to shape wire and harden it. Round mandrel - I used my ring mandrel, however a sharpie, large round pen, or a round make up tube would work too. Cut two 5" lengths of wire. With your chain-nose pliers, bend both lengths of wire roughly 1.5" from one end. Use your chain-nose pliers to pinch the wire closer together. 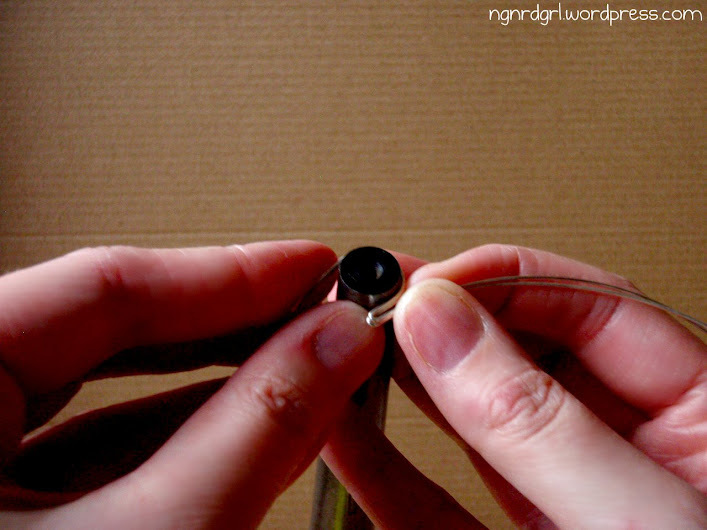 Bend the wire over a round mandrel, starting near the folded wire. 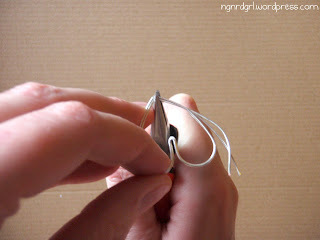 After bending both sides of the folded wire around the mandrel, your wire will now look like this. Use your chain-nose pliers to bend the wire to form the point of the heart. I approximated where the center should be. 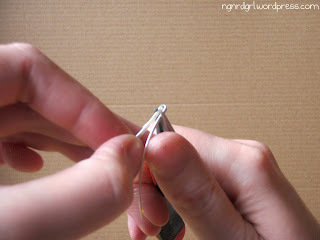 If you are off, just bend the bumps a little more around the mandrel. This is how your wire should look now. 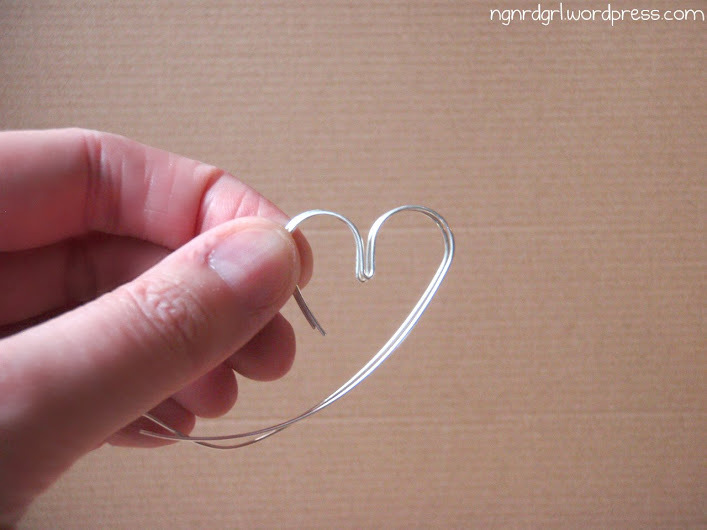 Using your chain-nose pliers, bend the wire at the end of the heart's bump. Trim both ends of the wires. 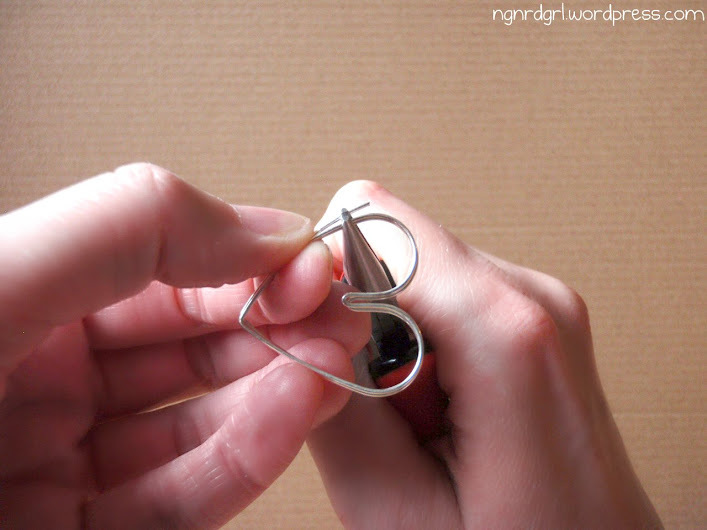 Using your need-nose pliers, form a p loop at the other end of the wire, as shown. Hammer your hearts with a mallet. Using a mallet instead of a hammer will keep the round shape. 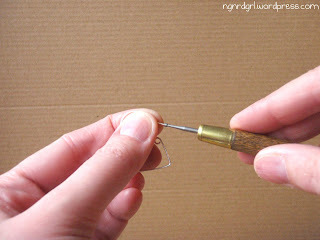 Use a cup burr or file to smooth the end of the wire. Ta da! 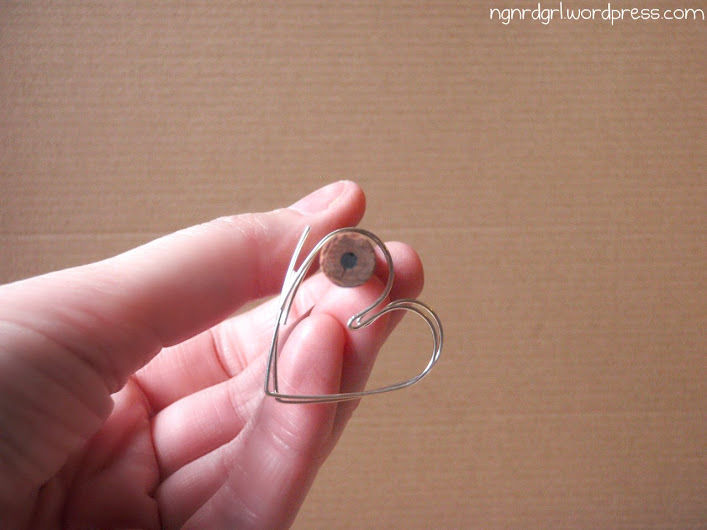 Your very own heart hoop earrings. Spooky how close these are to mine! I might have to add some beads onto mine. haha! 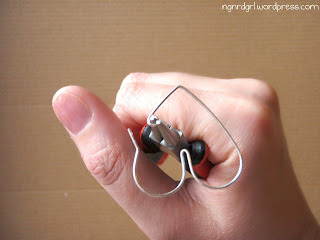 My tutorial can easily be adjusted to make these earrings. Notice that the top bump is slightly larger than the lower bump. Also, their post for sticking through the ear is longer and instead of bending the wire into a point, they do a P loop in the opposite direction of mine. 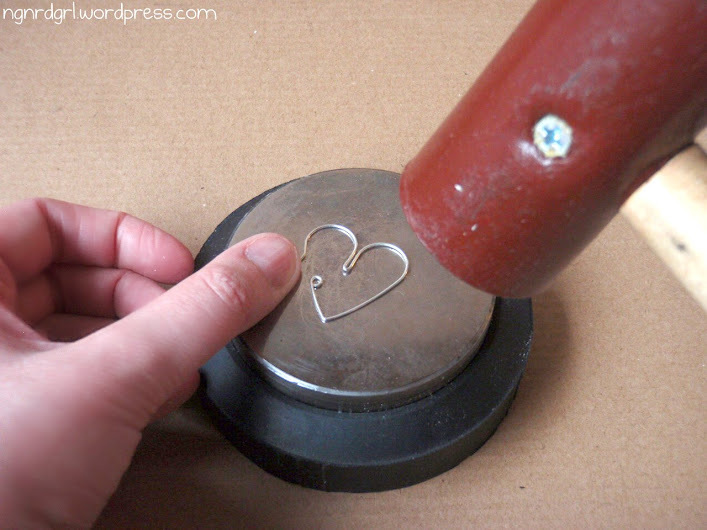 I used 16 gauge, half hard, German Jewelry wire and used a hammer to flatten it. I then wire wrapped garnet swarovski crystals. What do you think of my pendant? Guess what! 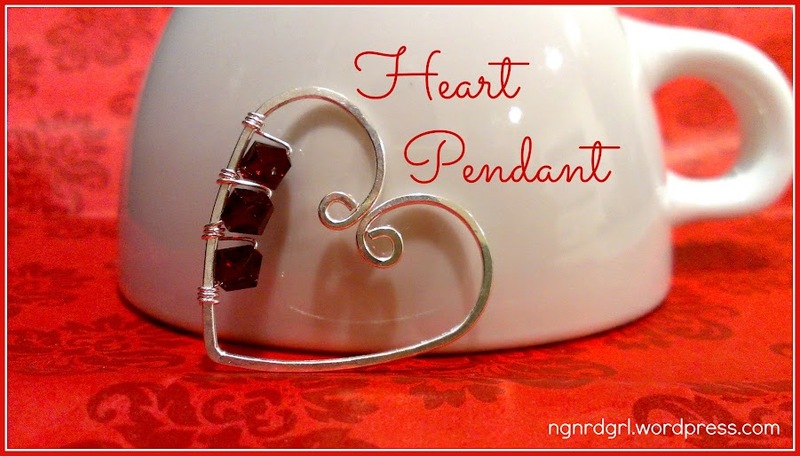 Starting this February 11th and ending on the 21st, you will be given an opportunity to win this Pendant! I will be giving it away as a part of A Crafter's Dream Group Giveaway! I'm so excited! 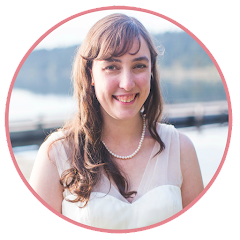 This is my blog's first giveaway! So don't forget to follow me so that you can be reminded of this awesome opportunity to own a handmade piece of jewelry by yours truly! These are super cute, Bethany! And I LOVE that last photo in front of an upside-down tea cup. How inspired! 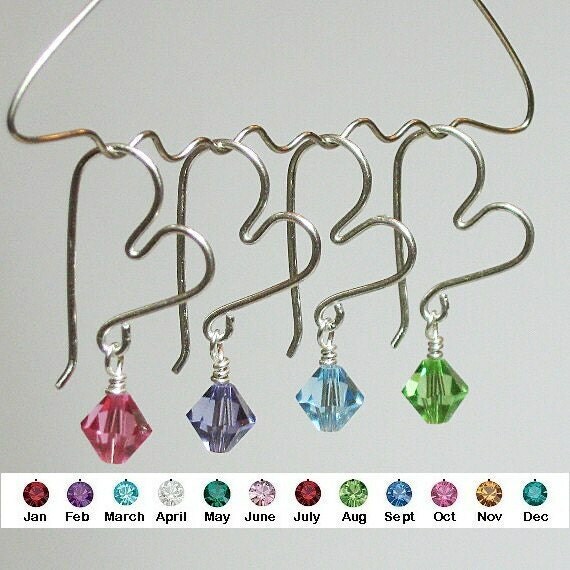 You're rocking and rolling with these wire earring posts. Do you mind if I ask what photo editing program you're using? 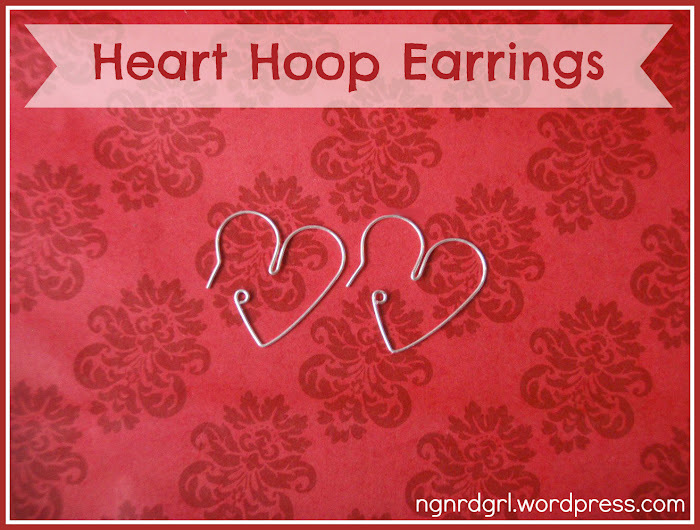 The image with the ribbon title "Heart Hoop Earrings" is exactly what I'd like to go for in a lot of my feature photos, but I'm limited in pixlr. Any tips you have to pass along are welcome! I have started using picmonkey to edit my images. It has two options, “edit a photo” and “create a collage.” The banners, labels and text are in the “edit a photo” option. If you make a collage, you can go back and edit it as a photo to add text. This is also the program I used to make my blog button. There are some great tutorials out there to use picmonkey. I just found one for making custom blog backgrounds by somethingswanky.com that really got me thinking on how I could customize the blog a little more with this program. Cheers! Thanks! Will have to start learning the ropes of picmonkey. I've been using pixlr and love it for most things...but have bumped up against a few roadblocks, like labeling pics. Wow, you make it look so easy! I want to go and make my own, since I have all what is needed, but I know my ending product is not going to be that nice! That heart pendant is gorgeous! Just linked up! Thank you for the invite. I love those earrings! Thank you for sharing at our Pinteresting Party! Your earrings & pendant turned out great! Thanks for sharing this. You do make it look so easy. They turned out beautiful. Thanks again and have a wonderful Saturday!! !